Bono channels German language poet Rainer Maria Rilke in Oh Berlin. Every once in a while, a new song just consumes you. With the special 20th anniversary releases of Achtung Baby, U2 have unveiled some gems they’ve been sitting on for two decades, including* the song “Oh Berlin.” I have not come up for air from this track since my first listen two days ago. Listen to “Oh Berlin” right now. *Author’s Note, 11/04/11: I haven’t been able to nail down when “Oh Berlin” was written or when it was recorded. The music sounds vintage (and the opening drum beat is reminiscent of “Acrobat”), and it may have been penned in some form in 1990 or 1991, but some of the vocals sound more like Bono today than Bono 20 years ago (especially his gravelly “For beauty is nothing but the beginning of terror”). A few other things cause me to believe it was finished in the re-release process. Bono’s use of “a festival of brown” in both the song and Guggenheim’s From the Sky Down documentary along with his mention of Rilke in The New York Times article in 2010 indicate those words and that author were freshly on his mind. Also, “Oh Berlin” is an exultation; it is an expression of victory and relief. It has a confidence about it that makes me think it could have been created only after Achtung Baby emerged as a whole and the band witnessed its success (not just critically and commercially, but also in its role of reunifying and redefining the band). This appeared in the Winter 91/92 issue of Propaganda (#15), U2’s official fan club magazine that ceased print production in 2002. U2 underwent a self-imposed exile in Berlin after The Joshua Tree (1987) and Rattle and Hum (1988) albums and the Lovetown Tour, which ended in January 1990. On Dec. 30, 1989, Bono gave his famous “We have to go away, and just dream it all up again” speech at the Point Depot show in Dublin. Ultimately, U2 would dream up something wild and wondrous, but only after a nightmare of division, dislocation and self-doubt — as a band and as individuals. U2 ran out of the arms of America, not back to their Dublin home, but to Hansa Tonstudio in Berlin, filled with angst about what was next. “The collapse of the Berlin Wall seemed to result in a general state of malaise within Germany,” says Adam in U2 By U2. “It was depressing and intense and dark and gloomy,” a suitable environment for a band that had lost its way. “Oh Berlin” is an autobiographical song that reveals U2’s creative struggles that took place in the city and that led to the ultimate realization of a new identity. It appropriates the poetry of Rainer Maria Rilke (1875–1926), one of the most significant poets in the German language. What follows is my breakdown of the lyrics and my best attempt to explicate them. Bono’s use of “crush” is replicated in “Zoo Station,” Achtung Baby’s grungy, startling album opener, when he sings, “I’m ready, ready for the crush.” The word’s double meaning serves both songs. In one sense, the band and its singer are about to be deformed (and ultimately re-formed) by a great force or pressure. In the other, they’ll indulge in an intense, short-lived infatuation with the city. The German here translates to “38 Köthener Street,” the address of Hansa Studios. Bono introduces what will become a rampant use of “looking” and “seeing” imagery. There is tension in his invitation to look around by stepping inside – eventually, the images of touring the city outside contrast with what turns out to be the more foreboding foreign land within: the studio, Bono’s blank, snow-white canvas, a symbol for the art yet to be born. But it’s difficult to navigate what isn’t there. Who could think they would find you by just looking? How many of us hide in you? Bono’s use of “oh” is a highly poetic type of utterance that informs us this is, indeed, an ode — a poem usually written in an elevated style, expressing deep feeling and meant to be sung. Check, check and check. He continues with this vocabulary of looking and seeing, or not seeing, in the case of “hide.” Achtung Baby as a whole is an exploration of darkness and light, visibility and invisibility, with lyrics like “I’m in the black, can’t see or be seen” (“Ultraviolet”) and “Love is blindness, I don’t want to see” (“Love Is Blindness”). But on that third point, perhaps an ‘uncheck’: the lyrics cease to be sung after this point, commencing a verse-to-verse alternation between words that are sung and words that are spoken. Though it goes without saying that even words spoken by Bono possess an inherent lyricism, the difference between song and speech resonates with the song’s tension between artistry and anonymity. Art has always worked by signaling its difference from the everyday, by calling attention to itself. Bono, the celebrity’s celebrity, wonders if his artistry cannot be achieved through anonymity. Even the Poet Laureate of the world would want his art judged on its own merits, and not to rest on his laurels. According to Adam, U2 were running away from Lovetown and Rattle and Hum as fast as they could, and found themselves at Hansa, where Brian Eno had helped David Bowie produce several albums, including Heroes. And Bowie brought Iggy Pop to the city to produce The Idiot and Lust for Life. Bowie described Berlin as a place “where nobody will take any notice of you, I was totally anonymous in Berlin.” U2 were looking for a similar anonymity in hopes of experiencing their own renewal and reinvention. They needed to escape the gaze of their fans and critics, and instead undergo intense introspection. 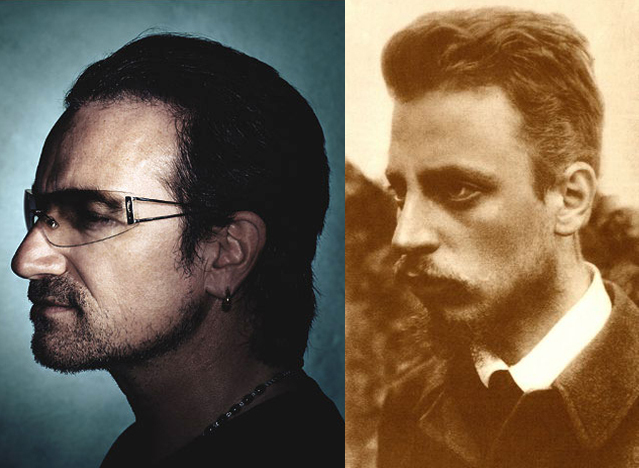 Bono will quote directly from Rilke by the song’s end, but here we start to see the poet’s influence. Rilke wrote often of the notion of “learning to see.” In his semi-autobiographical Notebooks of Malte Laurids Brigge, he writes, “I don’t know why, everything penetrates me more deeply, and doesn’t stop at the place where it always used to end. There is a place in me I knew nothing about. Everything goes there now. I don’t know what goes on there.” U2 were also trying to see what lay within them — what new feelings they could feel and sounds they could create and things they could say — by looking outward at a new, unfamiliar city that was in as much of an identity crisis as they were. And while The Joshua Tree and their flirtation with Americana had brought the band great success, reflecting on this success was less important than observing the newness around them in an effort to discover something untouched within them. Angels figure prominently in both U2’s and Rilke’s bodies of work. In The Joshua Tree’s “Bullet the Blue Sky,” Bono sings of Jacob, who “wrestled the angel, but the angel was overcome.” In this biblical story from Genesis 32, Jacob wrestles all night with a figure variously interpreted as the angel of God, God himself or Jesus. The conflict continues until daybreak, when, though injured, Jacob refuses to let go and he prevails over is aggressor. The angel of God gives him the new name Israel. Here, Bono personifies Berlin as the band’s angel. And after much struggle and conflict, U2 persevere and prevail and step into the light. They are given a new identity by Berlin. In the story, however, the angel never reveals his name, despite Jacob’s repeated asking. Bono’s lyric implies a sense of wonder that he does get to know his angel’s name. The lines, “kneaded him as if to change his shape” and “This is how he grows: by being defeated, decisively” return us to Bono’s lyric from “Zoo Station”: “I’m ready for the crush.” He needs to experience the crush to achieve the next level of transformation — the band must be broken down before it can be built back up. 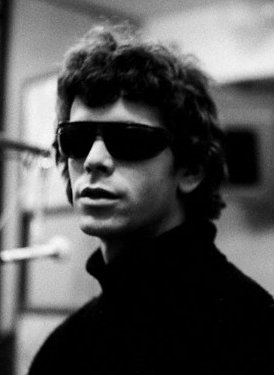 Bono’s Achtung Baby-era character The Fly was partly inspired by Lou Reed’s sunglasses. Here, Bono pays homage to their idols — David Bowie and Iggy Pop, who inspired the decision to go to Berlin; Lou Reed, longtime influence and occasional collaborator who has a song and an album named after the city (and who Bono credits for partly inspiring his alter ego, The Fly, with his sunglasses); Wim Wenders, a German film-maker the band met in Berlin when he directed the video for their cover of Cole Porter’s “Night and Day,” the first of many interactions; and, of course, Rilke. Bono insists on “remaining a true fan,” and reverses himself in the hierarchy between worshipped and worshipper. This is an especially important line, as U2 were accused of trying to place themselves among the ranks of the artists they played with, covered or channeled on Rattle and Hum: B.B. King, Bob Dylan, Jimi Hendrix, Billie Holiday, John Lennon, The Beatles … Bono is atoning for the transgression. And what inspired Wenders’ Wings of Desire? The Duino Elegies, a set of 10 elegies written by Rilke from 1912 to 1922. The final verse of “Oh Berlin” is taken directly from Rilke’s First Elegy. Bono is now reciting Rilke’s First Elegy, a fitting allusion within “Oh Berlin.” Rilke was staying at Duino Castle in Italy, suffering from a “long-standing creativity crisis” himself. Supposedly, he heard a voice calling to him one morning on his daily walk, speaking what became the first line of the elegy, and thus was born one of his greatest works. After U2 suffered through long, tense, unprolific recording sessions, “One” suddenly and serendipitously emerged one day. It became the heart of the album, and the message at the core reconnected and refocused the bandmates: one, but not the same. Bono changes the final line slightly by inserting “single,” which is an acknowledgement of Berlin’s (and the band’s) reunification. It is no longer East Berlin and West Berlin. There are no longer two names; there is one. To return to the start of the song, “Oh Berlin” opens with Bono speaking a lyric I can’t quite nail down. I’ve relegated it to the end of this post because, while I’m curious about it, I feel it’s secondary to the allusions already discussed. For all I know, it’s Bongalese that never got translated. Interpretation 1: @U2, the foremost U2 fan site, was the first to get the lyrics up and suggests the line is “hasse,” a conjugation of “hassen,” which is “to hate” in German. It would require an “I” (or “Ich”) to make sense: “Ich hasse” or “I hate,” not that Bono has ever refrained from taking poetic or linguistic or numeric (Catorce!) license. But such a hostile introduction is at odds with what is clearly U2’s ode to the city that brought them creative salvation. However, upon arriving in Berlin, U2 were experiencing a certain amount of self-loathing, so perhaps Bono’s “hate” speech at the start of the song is meant to mirror the beginning of their stint in Berlin. Interpretation 3: Maybe Bono is speaking the name of the actual site of their rebirth: Hansa Studios. Rilke’s Eighth Duino Elegy is the poem that appeared on scarves sold a few years ago by Edun, the for-profit fashion brand started by Bono’s wife, Ali Hewson, with a mission to encourage trade with Africa. 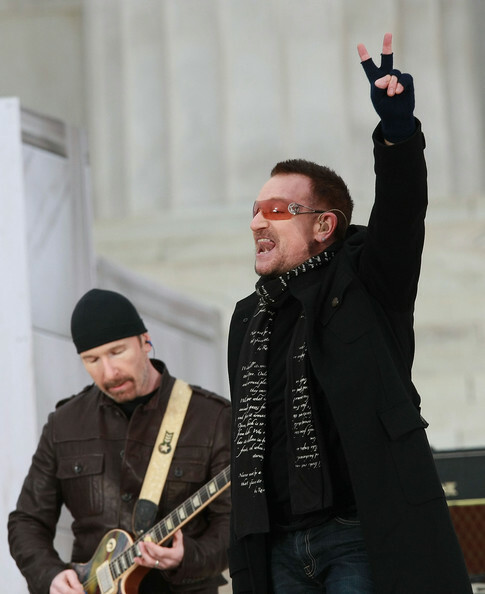 Bono debuted the black version of the scarf at the 2009 Presidential Inauguration concert. Since the clothing line’s launch in 2005, some of Rilke’s poems have been embroidered on Edun jeans. Rilke had an affair with a married woman named Lou Andreas-Salomé. The name Salomé has vast literary significance, and has become a symbol for dangerous female seductiveness. Salomé is the name of the bootleg of the Achtung Baby sessions. Multiple working versions of the same song appear on the CDs, believed to have been stolen and then unofficially released. U2 did ultimately finish and release a studio version of “Salomé” along with several remixes. Before his birth, Rilke’s parents suffered the loss of another child who lived just one week. In his early years, Rilke’s mother would often dress him up in girl’s clothing, as a way to hold on to the memory of her lost daughter. U2 famously dressed in drag for one of the video versions of “One,” filmed at Hansa Studios. WOW!! You are an INCREDIBLE writer. I am not sure even U2 has made or knows all those connections you’ve made! That is some wicked cool stuff you’ve connected there. 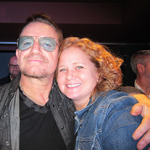 YOU HAVE to meet Bono!! If I EVER I am going to tell him he has to look you up. (I’ll have to do it in a vision to him because I will be dead from meeting him, but I will be sure to do it!) WOW!! Thank you so much, Danielle! I was intrigued by the song from the start. The bit of German caught my attention first, because I wanted to know what was being said. Then I kept uncovering more and more stuff. You’re right — I don’t know that it’s ALL intentional on U2’s part, but it’s cool to see the influences. I need to read so much more and familiarize myself with these external works. It’s easy to stay here in this little U2 nutshell. Great post Beth! One of the reasons I love U2 is because the English major in me always has plenty of symbolism, allusion, metaphor, etc. to sink her teeth into. David Bowie recorded his song Fame in a one day recording session in New York in 1975 with John Lennon. During the session a cover of the Beatles’ Across the Universe was also recorded. Bono, as we know, had a cameo in the 2007 Across the Universe movie. Excellent. Hated that I couldn’t do anything with that line when I knew Bono wouldn’t include anything arbitrary (thus my earlier lament about not listening to enough *other* stuff). I get a lot of the symbolism and allusions, but not nearly all of it. Need to broaden my (NLOT) horizons. Beth, This is very well written by the poet in you! Enjoyed reading very much and will read again too! Also, sent out to friends and loved ones. I follow your tweets and enjoy also reading them! Keep up the good work, you may have a career here! Hope Bono finds you too! All the best! Thanks so much, Lisa. I appreciate the feedback and your sharing the blog. “They” always say to do what you love, and U2 is certainly what I love, just haven’t figured out a way to earn a living off of listening to their music all day! A girl can dream out loud, though. Very insightfull – this band has so many depths! You can see why Oh Berlin was omitted from Achtung B but that chorus is pretty sweet. Very nicely done. Especially like the catch on “single name.” I suspect if there’s more to mine here it may come from the Wenders films – isn’t a flap of the angel’s wings significant there to change scenes or something (I haven’t watched it in at least a decade)? I haven’t actually ever seen the films, Chris. But I’m excited at this idea. I wondered at Bono’s use of “flap” — it’s a very distinct choice of word, and all the other lines in the song are so deliberate. If the flap signals a transition in Wenders’ films, that would just add to the poetry of it all. I need to check it out immediately! Thanks! Sheesh – almost a year later. Just wanted to mention what I’d forgotten on the wing flap – it’s also used in the soundtrack Stay (Faraway, So Close) video, which you might have more ready access to. I really appreciate your insights and informed speculations here. It’s definitely great to see the affinity Bono has for Rilke, too. Thank you for your time and effort in writing this.